There are two different types of canna rollers, but the symptoms and treatments are the same. The adult insects lay eggs on new leaves of a canna plant. IDENTIFICATION — There are two different types of canna rollers, but the symptoms and treatments are the same. 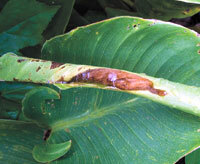 The adult insects lay eggs on new leaves of a canna plant. In the caterpillar stage they “stitch” the edges of young leaves together with a silken thread so they won’t unfurl. That provides the perfect hiding place as the caterpillar eats the leaf it’s rolled in. CONTROL — If you just have a few damaged leaves, pull the edges apart and squish the worm inside. Or if lots of leaves are already badly chewed up, snip them off and step on them. Then, in case there are any eggs on the leaves, don’t toss them on the compost pile. Send them away in the trash or bury them at least 3 ft. deep in the soil. Bt (Bacillus thuringiensis) mixed with water and sprinkled over the leaves is a good control if you find too many worms to deal with manually. Have a bug you need to identify? Check out The Secret Lives of Backyard Bugs at right to find out what lots of bugs look like at all stages of life! Impatiens come in an amazing variety of colors, shapes and sizes to fit almost any garden situation. If you want flowers all season long with minimal effort, this annual really fills the bill! You’ll find this strange-looking fungus growing on mulch, often at the base of shrubs. Artillery fungus forms small yellow “bubbles” that are less than 1?10 in. in diameter.